Grilled eggplant bruschetta with mozzarella, red pepper flakes and fennel seeds. Made with crusty Italian bread this simple snack, lunch or antipasto is light and delicious. Put a griddle pan over medium heat. Finely slice the eggplant lengthways and brush each side with a little olive oil using a pastry brush. Place the slices on the griddle pan in batches and grill each side until slightly charred and cooked through. Place the cooked eggplant on a plate lined with kitchen paper. Put the slices of bread under a hot grill and toast on one side only. 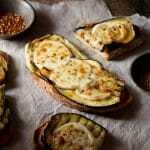 Place two slices of eggplant of the untoasted side of each slice of bread. Add extra eggplant to larger slices if needed. Top each bruschetta with mozzarella then sprinkle over a few red pepper flakes (chili flakes), fennel seeds then a pinch of salt and pepper. Place the bruschetta under a hot grill until the mozzarella has melted, bubbling and slightly golden. Cut large slices in half and serve hot.